Almost everywhere I had been so far in Scotland was leading me to Skye. Whether I was in Glenmore or Inverness or even the Shetlands, people kept telling me that some of the most beautiful scenery is along the western coast of Scotland and on Skye particularly. And they were right. Skye is certainly a place to see. Like Orkney and Shetland, Skye also has a series of tight knit communities filled with really great people. 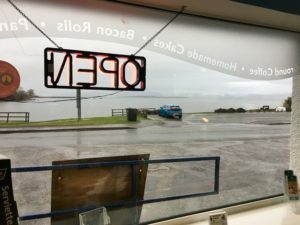 Hector’s Bothy is a little cafe in Kyle of Lochalsh just across the way from the Isle of Skye. They serve a great brie and cranberry panini. 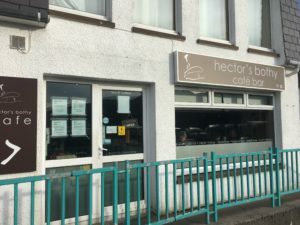 After arrive in Kyle of Lochalsh and grabbing a quick bite at Hector’s Bothy, a place that appears to be as popular with the locals as it is with the tourists who come to Skye, I walked across the Skye Bridge. I could have taken a car, but I had decided from the moment the train arrived that I wanted to do a day on foot and that I wanted to wild camp in Skye. I found a beautiful spot just outside of Kyleakin across the bridge. A local told me about the trailhead and said that it was a loop. I also knew there was a stream near the trail. It would be a great location to break out the tent for the first time, and the weather was perfect. I found a idyllic spot that was dry beneath some pines. I had water and plenty of firewood. I was set. That night it really rained for the first time since I’ve begun this journey through Scotland. I broke camp the next morning and hiked back out to the road and started for Bradford, which was about 7 miles away. I was starting to get a bit wet after covering a few miles on foot when a lovely lady named Gay from Dornie offered to give me a lift. She said that she knew what it was like to have to walk on a wet Scottish day and that’s why she picked me up. She dropped me off and wished me luck in my quest and went on with her day. I headed up the road and thought about what I would like to do next. I knew that I needed a place for my tent to dry out, which meant a hostel. Left: Nick is the owner of The Waterfront. Above: Not only does The Waterfront live up to its name, but it is located on the main road going in and out of Skye, which makes a popular spot. That’s when I saw The Waterfront Takeaway, a little fish and chips shop right on the edge of the harbor. I hadn’t had any coffee or breakfast, so I walked in and ordered a meat pie and a cup of joe. After being soaked to the bone, both hit the spot. And I wasn’t alone. I saw a lot of work crews stopping in, grabbing a bite to go, and heading out to begin their day. The Waterfront is a happening little place. The owner is Nick. He was an IT specialist in London who wanted a change in his life. He moved to Bradford almost 6 years ago to open his own business. “It’s hard work, but I find it rewarding and interesting,” he said. Debbie, the young lady, who works behind the counter at The Waterfront gave me directions to the nearest hostels as well as the bus stop. I decided to take the bus to Portree–except the bus was more like a bigger version of a van with train seats installed. I sat and looked at the scenery as I listened to two young men who had just met at the stop discuss the various iterations of the Call of Duty games that they had played on X-Box. The older one started discussing the storyline for one of the Call of Duty games which involved World War III and the installation of a world government with neo-nazi tendencies. He complained about American warmongering and proclaimed himself to be a proud communist. I took the opportunity to ask about a local ferry, and he was mortified to discover that he had been saying all of this beside an American. I laughed and told him that I wasn’t offended in the least. He asked what had brought me to Skye, and I told him that I was writing a travel blog. A young man in a sling named John, a medical student doing a pediatric rotation at Portree Hospital, asked some more about Searching for Stella. As most of my experiences on public transport in Scotland have proven to be, the bus ride to Portree was entertaining and interesting because of the people I met. After dropping my gear, I headed out to explore Portree. I wanted to find another trailhead that I could walk for an hour or two. I popped into Citizens Advice. I wasn’t a citizen, but I needed advice. There I met Alan who had just started working there about three weeks before. He told me that Citizens Advice is a national nonprofit effort in the UK. They give people guidance with all sorts of social challenges–legal, employment, health benefits, etc. 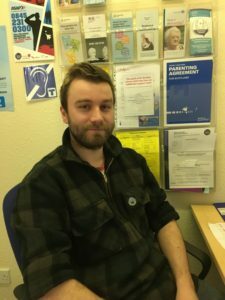 Alan works for Citizens Advice because he wants to help people, and he’s thrilled to be doing it in his home of Portree. Alan was glad to have his new job for a couple of reasons. The first was that it had allowed him to come home to Portree. Alan told me about a trail at the edge of Portree, Scorrybreac or Black Rock trail. He even opened Google Earth and showed me street by street how to reach the trail. He told me that I might see the remnants of a car wreck along the beach. “A farmer forgot to set the parking brake on his car and it rolled off a cliff,” he said. After a wonderful walk through a light rain, I came back into downtown Portree and saw school children in uniforms everywhere. They had been released for lunch and were going everywhere from convenience stores to cafes. I asked one of them where the school was, and I headed that way. 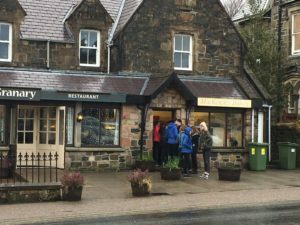 The students from Portree High School pour into MacKenzie’s Bakery, a locally owned shop, during their lunch break. Why? Because teenagers live on sugar! I went by MacKenzie’s later and had a raspberry tart and caramel bar to see what all the fuss was about. Both were delicious. 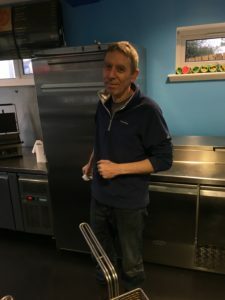 I’ve been wanting to visit a school since I came to Scotland, and here was my chance. I met a nice secretary at the reception desk and asked if I could speak with a teacher. She told me that it was impossible at the moment but that I could in thirty minutes. When I returned, I briefly met the head teacher. I told her about the blog and about my history as a teacher. I could tell that she was trying to be polite, but she had that look that many teachers have during the course of a school day–the look of someone who has 50 things to do and not enough time to do them. Suddenly, a young man in a uniform appeared. I asked if I could write about the school. She said yes, as long as I didn’t take picture of students and staff and didn’t use names. I agreed. So, here’s what I learned from the head boy. 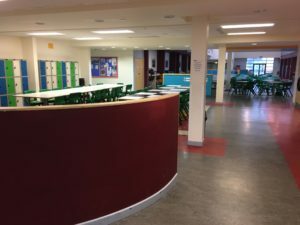 The reception area of Portree High School is bright, warm, and inviting. Portree High School is the only high school on the Isle of Skye and serves all of the children. It has about 500 students. They have a variation of a 6 period day. They have opportunities to go on school trips through out mainland Europe. There were bulletin boards filled with pictures of these various trips. He said that they were planning a trip to China. There was another bulletin board that had pictures of last year’s performance, 15 Minute Hamlet. Now, here’s where things got really interesting for me as an American. The gym and the pool are actually resources that anyone in the community can use–as long as they aren’t doing so when the students are using them. The library, which is adjoined to the school, is not the school library. It’s the community library. The students check out the materials, but any adult can come in and use the wifi or other library resources. As I walked around Portree High School, I kept seeing the 15 year old X-Box lover from the bus ride from Broadford that morning. We smiled and said hello to one another. 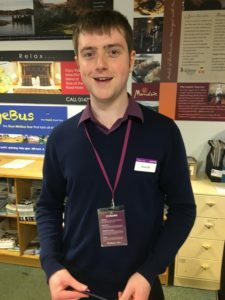 Ruairidh works for tourist information center for Skye, which is located in Portree. He’s a proud graduate of Portree High School. That’s when I started to really get it. There is more of a synthesis between the school and the community here. The school is not an out-of-bounds area. There’s security to protect the students, but the grounds are not a no-go place for the people of Skye. That concept, I think, is also prevalent throughout the UK. The kids use the public transport to get to school. It’s figured into the bus times, and you can see it on any bus schedule. 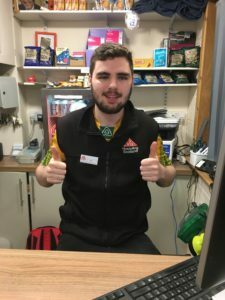 Ruairidh, or Roderick, who works at the tourist information center and helped me figure out my next step in my travels, is a graduate of Portree High School. Although I didn’t ask at the time, I’m betting Alan is as well. J.D., a young man who works at the hostel here, is also a graduate. J.D. grew up in Portree and works at the SYHA hostel there. He’s also a proud graduate of Portree High School. And the common factor with all three men, and I bet with many of the people who grew up in Skye and attended Portree High School, is that they are proud of their home. They love it. Even as I write these words, I’m still amazed by the day I had–a day that started in the woods and ended up in a school. I think the US education system could borrow some ideas. I remember working in Sweden, my students frequently rode the public bus home with me. It was nice being able to chat about not-school, get to know them as young people. What you wrote about the safeguarding measures is very familiar to me, now that I work in an international British school. The UK government takes this very seriously (as they should) and teachers undergo a great deal of training. Schools usually have safeguarding officers appointed from within the teaching staff. We all hope we never need to use it, but good to know it’s in place.